He watched the symbols and numbers spin. The machine made a single bing and a quarter dropped down. He chased it around the tray and plugged it back in. It binged again, the light atop spinning seductively. As he scooped the coin out of the tray it slipped through his fingers and rolled across the carpet. Swearing under his breath he rose to retrieve it. In a flash the woman took his place. “Hey!” he called as she dropped a coin into the slot. Bells, whistles, and squeals of delight. Smiling coolly she captured his reward. Where was God? 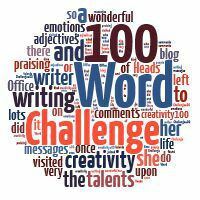 To take part in the 100 Word Challenge go here! This link closes April 5th!